Treviso's Gori had a 2010-11 season to remember. After a solid start to the campaign in the then Magners League, Gori was called up to Nick Mallett's squad for the autumn internationals. 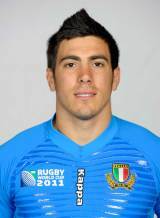 Gori started at scrum-half against Australia and Fiji with the Italian's recording a win against the Islander rivals. Having started once during the 2011 Six Nations, Gori was named in Mallett's 30-man squad for the 2011 Rugby World Cup.